What Will Happen to California After Trump’s Exit From Paris Accord? As President Trump announced the U.S. would leave the Paris climate accord, California’s political leaders quickly declared that the state would step up on the international stage. 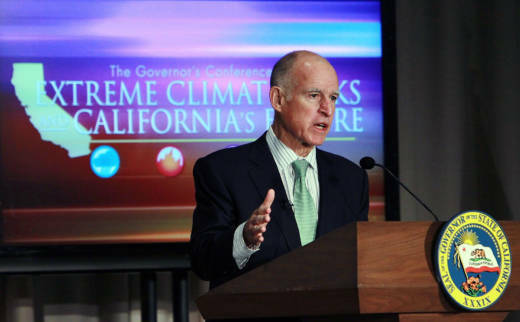 Governor Brown vowed to continue building his own international climate movement. Around 170 jurisdictions, including states, provinces and cities around the world have signed onto Brown’s Under2 MOU, which means they’ve agreed to cut emissions by 2050. Governor Brown is heading to China next week to hold climate meetings with many of the signatories. He also announced an alliance today with the governors of Washington and New York, looking to convene states that are committed to upholding the Paris accord. What will that agreement accomplish? And what does the U.S. exit from the Paris agreement mean for California’s climate policies? We asked Michael Wara, Associate Professor of Law at Stanford University. Does Governor Brown’s climate agreement have any teeth? It's a voluntary pledge. There’s no climate police that are going to come and knock on the State of California's door if the state fails to meet its commitment. But I think it's important to recognize that the same thing is true for nation states that are parties to the Paris agreement. The Paris agreement commitments are voluntary and the only thing that's mandatory about Paris is the reporting obligations of state. They have to say what they actually end up doing. So I think the Under2 MOU in a way establishes a very similar system but for states and other provinces that are interested in going further than their national governments will go. It also creates kind of a system for sharing ideas and sharing what works. And in many ways you know that's as important a contribution as the actual commitment. Because California has a long history dating from the 1950s inventing new ways to reduce air pollution. And one of the biggest benefits we can provide as a state is to share that expertise with the rest of the world. Do you think California’s efforts will calm nerves on the international stage after President's Trump speech? damage to its credibility as a partner and as an ally. I don't think that the other nation states are going to act differently in the Paris Agreement context because of California. California’s core climate policies, like renewable energy goals and clean car regulations, are state-level policies, so they won’t be affected by President Trump’s move. But what else might be at risk? So the place where this might matter - and I think it remains to be seen - is in terms of California's international efforts on climate that look more treaty-like. Like efforts to connect our cap-and-trade program with other cap-and-trade programs that are in Canada and to accept internationally based carbon offsets into our cap-and-trade market. These kinds of policies that look a little bit like foreign affairs get more risky from a legal perspective when they're out of line with what the State Department wants. There have been issues in the past with California taking a different position than the State Department and being forced by the Supreme Court to step back from that position because it was interfering with the U.S. policy.